I just took in a 5 yr. old GSD last week. She is very friendly with any person she meets. She does not bark at all, and follows my every move. She also does not care for cats, and is very dominant when meeting any other dog up close. And she usually wins the title of queen over the other dogs that she meets. is this normal behavior, or is she missing her old pals that she left behind at the old owners home ?? Thanks ! It could be possible that your GSD was taught not to bark by the previous owner. How old was your GSD when you got it? 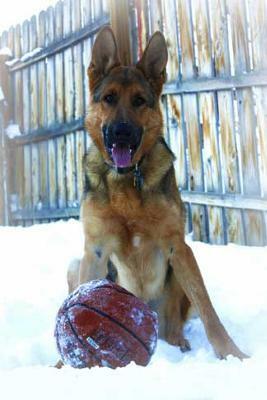 It is very possible that your GSD misses her old life, but it's time to make her your your dog. Since GSDs are very social animals... they want to please their owners. They tend to attach themselves to one person over anyone else. It sounds like that someone is you. I have a yr old that does me the same way. she follows me to the bathroom, or anywhere else I go. If I leave, she will not go inside with my husband until i return. As to why your dog will not bark, you might want to take it to the vet for a check-up. There might be an underlying cause. Very normal. German Shepherds are very social - she wants to be with you. That also means she wants to play with you, be with you and to spend time with you everywhere so if you have a new "furry shadow" just know that that is very normal and enjoy the fact that your German Shepherd dog wants to be with you.